Ballyboden won their last Dublin SHC title in 2013. 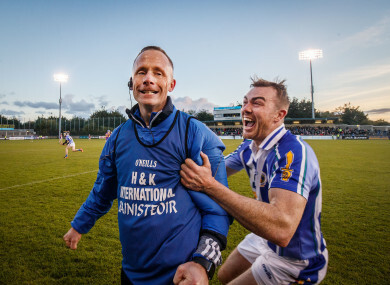 Ballyboden St.Enda’s manager Joe Fortune celebrates at the final whistle with Simon Lambert. AFTER THE NORMAL and extra-time drama in the drawn final last week, Kilmacud Crokes and Ballyboden St Endas drew swords for the second time in eight days, today in Parnell Park, in the Dublin senior hurling championship replay. With Boden having shown their value over 80 minutes last week, Joe Fortune’s charges had seen their odds on taking their first championship since 2013 slashed to even money since having come in as outsiders before the drawn final. In the end, the even odds would prove more than justified as Boden pulled out a powerful second half performance to come from two points behind to win by three. They got the dream start when Conor MmCormack netted the easiest goal of his life, flicking home at the end of a superb Boden move, before an even match settled down. Conal Keaney, who would score four from play, Simon Lambert and McCormack were hurling well for Boden but with Marc Howard causing trouble for Crokes up front and Ryan O’Dwyer controlling the hurling from centre back again, it was 1-6 to 0-6 to Boden when controversy erupted in the 23rd minute. A cutting run from Howard looked destined for goal when he was unceremoniously taken out, cutting his afternoon’s involvement short. Only a yellow card was brandished, with many expecting more, and Oisín O’Rorke missed the ensuing penalty to add insult to injury. Anthony Daly was clearly upset, justifiably so, before a talking to from the man in black settled him down. However a rip-roaring end to the half would see O’Rorke recover to put up a quick three points, two from play, before, Ronan Hayes slipped him through for a goal to put Crokes two to the good at the break, 1-9 to 1-7. With Crokes slightly on top early in the second half, a clever 25 yard free from Paul Ryan, struck between the defender and post, found the net to give Boden a two point lead they would never surrender. With Crokes’ Ryan O’Dwyer joining Howard on the injured list on the bench early in the second half, off the back of another infringement which resulted in a Boden yellow card, Crokes just never got a foothold in the game. A strong last six minutes of normal time brought Crokes back from three down to just the minimum, but with Paul Ryan’s cool head dictating the play for Boden late on, they held on and added two more, running out winners by 2-15 to 1-15. Scorers for Ballyboden: Paul Ryan 1-5 (4f), Conor McCormack 1-1, Conal Keaney 0-4, Aidan Mellet 0-2, Paul Doherty 0-1, James Roche 0-1, Collie Basquel 0-1. Scorers for Kilmacud Crokes: Oisín O’Rorke 1-7 (5f), Marc Howard 0-4 (2f), Ronan Hayes 0-1, Coalán Conway 0-1, 25 Alex Considine, 0-1 Naomhán O’Riordáin 0-1. Email “Ballyboden crowned Dublin hurling champions after narrow replay win over Kilmacud”. Feedback on “Ballyboden crowned Dublin hurling champions after narrow replay win over Kilmacud”.